The incidence of syphilis decreased 15% in Tuva over 9 months, 2006. Apart from six districts (kozhuuns), where syphilis incidence increased up to 68.2%, a decrease was registered in the rest of Tuvan area. Moreover, gonorrhoea incidence lowered 16.4%, and scab – 18.8%. A case of inborn syphilis was registered by doctors in Kyzyl, the capital of Tuvan Republic, Tuva Online news agency reports. There are about 305,000 people living in the South Siberian steppes and mountains of the Tuva Republic of Russia, a landlocked region at the heart of Asia. Theirs is an ancient culture and their music-making is among the world's oldest and most unusual. St. Clair Productions will present Huun-Huur-Tu, one of the best known performing groups of Tuvan throat-singing, on Friday, Oct. 27, at the Unitarian Universalist Fellowship of Rogue Valley, 87 Fourth St., Ashland. If you want to ... explore the outer edges of jazz, hear the extraordinary Sainkho Namchylak (Cargo, November 14), the mountain-chanter from Tuva in Siberia. She can sing with operatic purity, plummet into an overtone-laden world like a distant didgeridoo, creak like a chain straining on a winch or flutter like a songbird. Abandoning children becomes more often in Kyzyl, the capital of Tuva, State TV and Radio Broadcasting Company "Tyva" reported. Three small abandoned children were found in Kyzyl streets on one day last week. The first telephone call was received by police in the afternoon on October, 12. A child was found near the orphanage in Suvorova St. by teachers. It emerged that 18-month-old Ulzana Shyyrap had been taken to the children's home by her mother. The third 'Kyzyl-Moscow' Festival is to take place in mid-November in the Russian capital, festival directir Georgi Beletski told Tuva-Online. Among Tuvan groups and performers who would take part in it are 'Saradak', Khogzhum', Kheimer-ool Khovalyg, Khakassian singer Yulia Charkova, and an ensemble of authentic music from Irkutsk. 'Karmaland', Sainkho's new poetry book, complete with her new CD, these days is presented in Italy. A number of presentation will take place - from Turin to Milan. This is not the first belletristic experience of the famous Tuvan singer currently based in Austria. 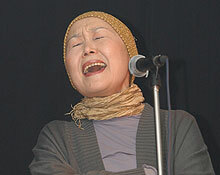 Her first verses were published in late eighties in the Tuvan 'Ulug-Khem' literature magazine. World-largest Frankfurt Book fair this year saw 7,272 exhibitors from 113 countries display almost 400,000 titles while India as Guest of Honour country promoted its culture and literature. 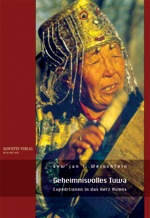 Among new books presented at the 58th edition of the fair was a Tuvan one published at Alouete Verlag (Hambourg, Germany) - Misterious Tuva. Expeditions into the Heart of Asia' (Geheimnisvolles Tuwa. Expeditionen in das Herz Asiens) by Sevian Vainshtein. 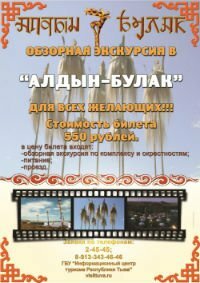 It is based on ethnographic notes made by Moscow researcher Sevian Vainshtein in course of his 10-year-long studies in Tuva.